I have a Linux Mint VM that I spun up as a transparent proxy for iOS devices. My intention is to tunnel all traffic from the iOS device through the VM and intercept it with Burp Suite, as an application I’m analyzing does not respect system proxy settings (the app is written in Xamarin). Some context for the rules above: enp0s3 is my VM’s bridged adapter, tun0 is the default OpenVPN interface. The problem is that the VPN only works when the PREROUTING rules do not exist. If I add in the PREROUTING rules to iptables, the client can’t connect to any webpage on the Internet (but is curiously able to connect to local web servers within the network). Is there a way to forward/redirect traffic from OpenVPN (or indeed any other modern VPN such as L2TP over IPSec, Cisco IPSec) to Burp Suite for traffic analysis, or am I out of luck? 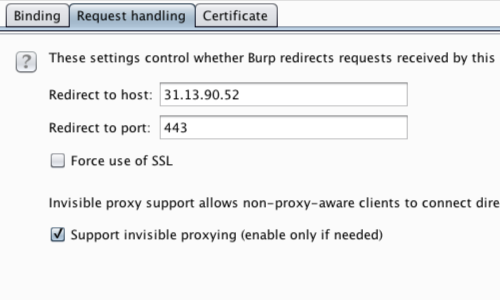 You need to enable the option ‘Support invisible proxying’ in Burp’s options. How to block Googlebot quickly? how can I configure Google Cloud SSH browser to not change the hostname? lamp – is this virtual host creation process correct?